The mansion is a Queen Anne Victorian-style structure that was completed in 1891 at the cost of $150,000. Among its 42 rooms, it features a four-story turret, gilded murals on the ceilings and frieze, marble and tile fireplaces, and original leaded and stained-glass windows. First used as the home of the city's mayor, the structure then served from 1920 to 1962 as a children’s home for the less fortunate. Today, the home has been restored to serve as a public museum as well as an entertaining space for weddings and private dining events. 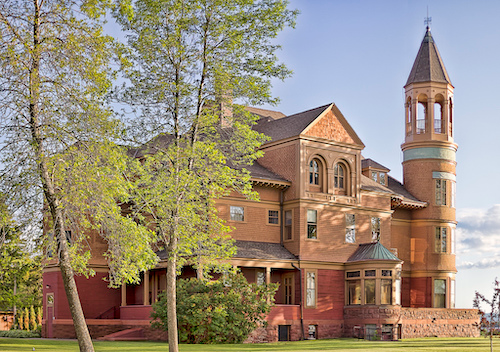 The City of Superior, Wisconsin, is soliciting bids for the coating and reroofing the Fairlawn Mansion. Bids are due for this project by Feb. 1. The awarded contractor is responsible for the complete replacement of the asphalt shingle roof, in addition to the repairs of wooden cladding and trim. Bid alternates have extended the scope of work to include coating services for the exterior of the building in its entirety, individual facades and cedar shingles. Prior to applying coatings, the contractor is to first repair or replace any damaged wooden surfaces, except for historic wood windows, storm windows and window trim, which has recently been restored. Proper steps must also be taken to insure the protection of the mansion’s landscaping, window glazing and sites not scheduled for painting. During surface preparation, the contractor is cautioned to clean and remove any damaged coatings carefully and without damaging the exterior surface. Methods of removal can be by hand-scraping, hand-sanding, chemical strippers or thermal removal. Destructive methods such as torches, pressure-washing or blast-cleaning are prohibited. Removal and replacement of other deteriorated or missing portions of sealer/caulking will fall under the contractor’s responsibilities as well. The contractor will oversee the coating of the exterior wooden surfaces with a three-coat latex system. The first coat of this process will be with a solvent-based alkyd primer/sealer. Then, based on the location of application, the contractor will apply two coats of high-gloss latex, semi-gloss acrylic latex or flat latex. The contractor will also remove the existing coating on the cement porch and recoat the surface with a concrete sealer. In addition, the contractor is instructed to coat all foundation-level PVC pipe protrusions to match adjacent surfaces. Owner-approved brands include Sherwin-Williams, Diamond Vogel, Benjamin Moore and The Glidden Co.